A small spreading tree. 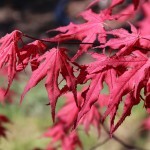 The leaves are bright red in spring, maturing to deep purple with prominent, darker veins. It colors in the fall to orange and bright red. It prefers well-drained, acidic soil and full sun to part shade.